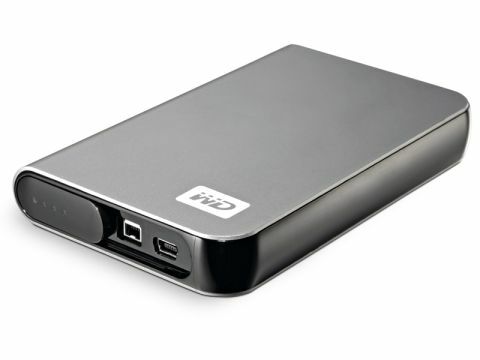 This is the third version of Western Digital's My Passport Studio pocket drive, and it should appeal to anyone who needs a drive for backing up data on the road. Just slip it in your suitcase and away you go. Three different types of Passport drive are sold by Western Digital; the other two being the Elite and Essential versions. The Studio is the only version pre-formatted for Mac, and the only one with a FireWire 400 option. This drive has a clever port array that lets the FireWire 400 cable split where it joins the drive; one part supplies the power and the other ferries the data. We tested the read and write speeds of both FW400 and USB protocols and found them to be in line with predictions, and acceptable. The drives are available in sizes up to 320GB and arrive configured in the HFS+ Journal format, so they don't need any configuration for Mac OS 10.4.11 or later. The first time you plug it into your Mac you will be prompted to make this your Time Machine backup, which isn't a bad idea. No software needs to be installed, but you do get the option of using WD Drive Manager, which comes in the box. Drive Manager doesn't do anything exciting, but if you install it you can see at a glance how full the drive is by clicking an icon in your menu bar. There's no encryption software in the bundle and no other locking mechanism, so this isn't a good choice for holding sensitive data. The price per gigabyte is high, but some value is added by the five-year warranty, which gives peace of mind against the creaky build quality, though we definitely would have preferred a stronger build and shorter warranty! After all, what good is a replacement drive if you just lost all your data? All in all, it's not a bad drive, and is good-looking enough to pull out for presentations.